2010 he proved evm can be hacked. Ec filed case against him asking how he got access to evm,..
now they are not letting him in to discussions as he involved in evm theft. a lekka prakaram aithe, mock polling 2-3 times conduct chestharu kada uncle, appude telisi poddi kada evariki enni vachayi ani. appude tesi vestharu evm ni. ela chesthavu? akkada special ga buttons emi undavu kada. demo/real version ani. both are same kada. Even is vulnerable to hacking or tamper. first thing evm's internet base to work ayyevi kavu, even blue tooth kooda undadu. just like our regular calculator. evm ni manage chesthene saripodu ippudu malla vvpat count undi kabbatti 2 ni manage cheyali. first a evm chip ni ela access chesthavu. plus entha dooram lo manam a chip ni access cheyagalam? ec staff cheyataniki, party sympathaizers chala mandi untaru, vallaki a instructions vasthe e patiki out ayyedi. bhel engineers emi counting daggara undaru kada emina change cheyataniki. a 1 party symbol ki ani ekkada load chestharu? fan/lotus ki ekkado oka chota rayali kada if totalcnt>200 aithe ani? plus e evm e booth daggariki pampalo kooda teliyali kada. annitlo rasthe eay ga chikkutharu. Even if one assumes that there is no hacking EC should ensure that every VVPAT machine for 1000% should ensure 7 seconds display. If not, there is no point in having a time of 7 seconds. Mock polling, therefore, should not be done just for the initial votes. It should be done throughout its life cycle randomly at least for 20-25 votes and for around 6-8 times in its total capacity. This may increase the confidence. adi emi antha easy kadule mastaru, manam rase c#, java prog lo human interpretation/ high level lo rasi danni machine level language lo ki maristhene decode cheyatam kasstam like dll's. evm lo vade code definite ga user ki e matram artham kani laguage lo ne untadi. vadu inner ga 2-3 chips vadi untadu. every time button press chesinappudu username/pwd ki definite ga oka chip undi untadi. 2-3 chips marchalsi untadi oka evm ni hack cheyali ante. earlier hack chesaru ante adi only display unit ni hack chesaru anthe kani chip ni ekkada access cheyaledu. only option emiti ante a BHEL engineer gadi daggara unna code ni evadina copy kotti, chip ni ela access cheyachho telisthe ne idi possible that to with out blue tooth. plus code replace cheyali ante needed username/password laga peetti untaru mari antha dumb ga aithe rayaru ga. plus a EVM 3 assembled units anta currently, a design chesina sold chesina top level notch gallani pattukovali emina cheyali ante which is not possible. money kosam emina chestharu kabatti manavallu a enggs pattukunte longutharu . chip ne access chese feasibility undi unte e patiki rafeal, f-16, boeing-747, ac, fritz, tv chips ni oka danni pani chyeanchatam apina e patiki motham poyeyi. Once you have physical access to electronic hardware any thing and everything can be hacked. it all depends on amount of time and resources that goes in to it. Of course this gets easier if one has insider help. Why do you need DLLs ? No junky windows DLL stuff involved in these machines. This is called embedded software. Some refer it as firmware/micro code/machine code. We hacked machine code of Electronic Display board like the one used in train stations and other public places as 3rd year students without any help. I can imagine what a professional can do if lot of money is involved. 100s machines were 'repaired' for hours at a time. That is more than enough time not just replace "chips", they can replace the entire PCBA (printed circuit board assembled, some times called mother board) in 5 minutes. ﻿﻿﻿﻿ Once you have physical access to electronic hardware any thing and everything can be hacked. it all depends on amount of time and resources that goes in to it. Of course this gets easier if one has insider help. ﻿ Why do you need DLLs ? No junky windows DLL stuff involved in these machines. This is called embedded software. Some refer it as firmware/micro code/machine code. We hacked machine code of Electronic Display board like the one used in train stations and other public places as﻿ 3rd year students without any﻿ help. Our seniors hacked a PCO monitor (billing machine used at﻿﻿ phone booths for STD/ISD calls). I can imagine what﻿﻿﻿﻿ a professional can do if lot of money﻿﻿ is involved. 100s machines were 'repaired' for hours﻿﻿ at a time﻿. That is more than enough time not just replace "chips", they can replace the entire PCBA (printed circuit board assembled, some times called mother board) in 5 minutes. practical ga matladukunte that is not that easy, display monitor ni cheyachhu because there will be no security for that. you can access through the signals. dll's ni nenu just example ga ichanu, on that way they use high end tech ante anukuntunna. device ki physical access unte rigging ne chestaru kada, malla danni malfunction cheyatam enduku? 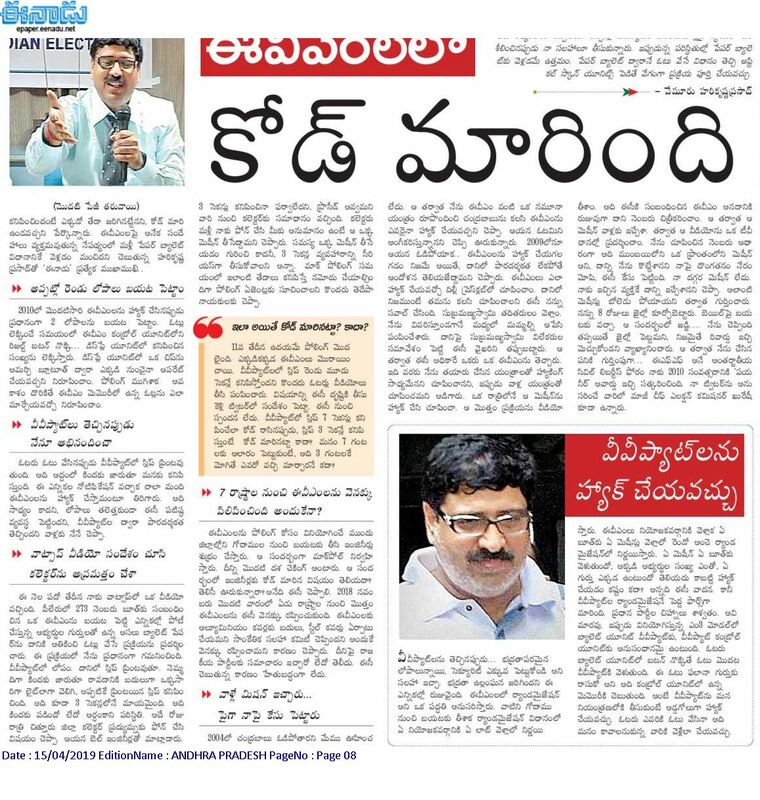 a 3rd party engineer vachhi vaadu emi evm code lo change cheyaledu, vallu cheppina dani prakaram e employees ki training sariga ivvaledu, vallu vvpat ni clear off cheyakunda edo chesaru ani chepparu. chip ni physical ga untene access cheyagalam, plus you have to invest lot of time and lot of money. samsung vaadu apple phones koni vice versa hack cheyalera , vallaki unna high end engineers ki? evaru chesaro kooda teliyadu. china vall fighter jet different issue, vallu us daggara technology ni copy chesaru through cyber services, anthe kani flight koni danni dupe ga emi cheyaledu. ade truth kanuka aithe china vallu rafeal fighter okati koni mana india lo vatiki chip access dwara motham disable cheyachhhu kada. You mean to say EVM machine may have better security, of course yes but who said there is no security in commercial display boards 😀? Yes, I said in my every sentence, it depends on "time" and "resources". If you are talking about few crores, no. few hundred cores, may be. Few thousand crores, definitely yes. I am not saying EVMs used in AP elections were hacked. not at all. My argument is only about whether is is possible or not. Time: Hackers had plenty of time on their hands. Somebody could have gotten few units of each model from BHEL/ECIL couple of years earlier. could have reverse engineered and made working model of their own by now. question is how the hacked software gets in to the official EVMs in polling booths. Since these machines don't have networking support, you can't hack them in bulk. every machine had to be physically accessed to alter/hack. This is where the mechanic comes in. Fighter Jets: complex thing is not hacking (for a country like china) but the delivery. suppose china hacked Rafael software offline. How can they put hacked software in Indian jet? Are we going to allow chinese engineers to repair our Jets just like EC sent mechanics to repair EMV s in booths? By the way, software that runs Samsung phone is million times more complicated than these basic push button scanners so called Electronic Voting Machines. You mean to say EVM machine may ﻿have better security, of course yes but who said there is no security in commercial﻿ display﻿ boards 😀 ? Yes, I said in my every sentence﻿﻿﻿, it depends on "time﻿﻿" and "resources". If you are talking about few crores, no. few hundred cores, may be. Few thousand﻿ crores, definitely yes. I am not saying EVMs used in AP elections were hacked. not at all. My argument is only about whether is is possible or not. ﻿﻿﻿﻿ Time: Hackers had plenty of time on their hands. Somebody could have gotten few units of each model from BHEL/ECIL couple of years earlier. could have reverse engineered and made working model of their own by now. question is how the hacked software gets in to the official EVMs in polling booths. Since these machines don't have networking support, you can't hack them in bulk. every machine had to be physically accessed to alter/hack. This is where the mechanic comes in. ﻿ Fighter Jets: complex thing is not hacking (for a country like china) but the delivery. suppose china hacked Rafael software offline. How can they put hacked software in Indian jet? Are we going to allow chinese engineers to repair our Jets just like EC sent mechanics to repair EMV s in booths? ﻿﻿ By the way, software that runs Samsung phone is million times more complicated than these basic push button scanners so called Electronic Voting Machines. nenu cheppedi enti ante antha easy kadu only chip ni access cheyatam ani. prog rasedi oka chota, chip design oka chota, assembled unit oka chota, testing oka chota all units ni kalupukotam kastam aiddi. mock polling taruvatha evaru touch cheyaleru, polling aipoyaka battery tesi vestaru evm's ki so physical access ekkada dorikiddi? chip modify cheyali ante high end lo unna samsung/apple vallaki adi emi antha problem kadu kada, apple vadini samsung vadu money or edina era chupisthe easy ga padatahdu vice versa. time resource anukunte bhel engineers gadini pattukonte o pani aipoddi ga. only evm's ni hack chesthene kudaradu, vvpat ni kooda marchali kada. even okasari hack chesina, vellu eppatiki appudu aupgrade software edatharu kada. plus evm release ainappudu n no of checks untayi. avi pass avvali. casio scientific calculators ne change cheymandi chuddamu, andariki open ga dorukuthunnayi kada easy ga? danni modify cheyamandi with out physical access. mana vallu raise chesina vatilo 2 key factors unnayi. -----these two are valid, rest of antha like evm hack anedi na drustilo antha easy kadu.